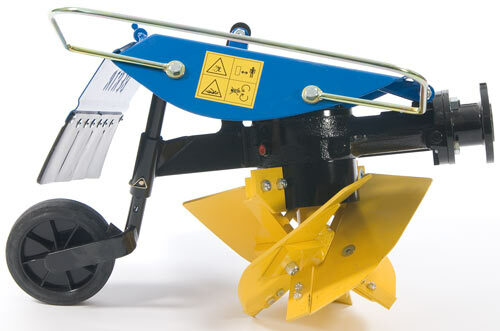 Questions on the BCS Rotary Plow Attachment? The BCS Rotary Plow Attachment looks a bit like an acorn that spins. effort or traction to move it through the soil as it spins and throws the dirt out of its path..
in the plow. At the same time these plants tend to get mixed in very nicely into the soil which help facilitate nutrient replenishment of the soil. time as it does a great job turning everything under. around and go back through the opposite way you can double the size of your furrow and throw the dirt the other way....in effect creating a ditch..........by going back and forth you can create a rather deep and large swail....ie. Ditch......the rotary plow can go up to 12" deep so you can really dig things up........rocks and hard ground have little effect on it.......the reason it cannot replace a tiller is that it leave the surface uneven and a tiller is needed to smooth things out.......we sell a fair amount of these rotary plows mostly to folks who have a specific need or a lot of hard sod to break up.....there are other things folks use these for ....such as bed edging....making raised beds and using it to cover crops with dirt such as Potato's and carrots..